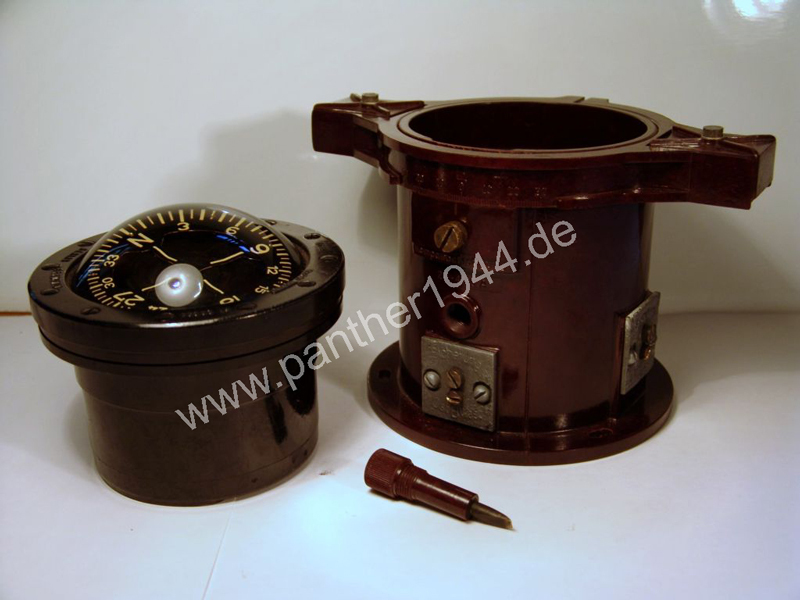 Der Orterkompass Ok 38 (navigator compass) belonging to the MBT V Panther – a mystery? 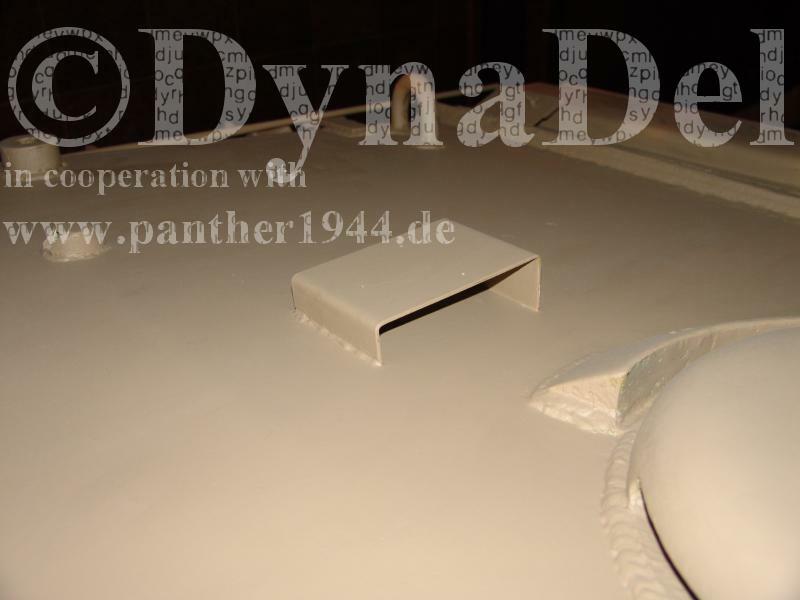 A small platform is located cantered on the turret roof on the last produced Panthers. Do to relevant literature this part is called “Orterkompassstand”. But what is it? Why was is mounted? And what the heck is a „Orterkompass“? Here now the conclusion of the research results until now. Starting at the end of 1944 Panthers eqiupped with infrared devices were projected to establish night combat capability. There were also Sd.Kfz. 251 outfitted with infrared searchlight for the illumination of targets planned, called UHU. 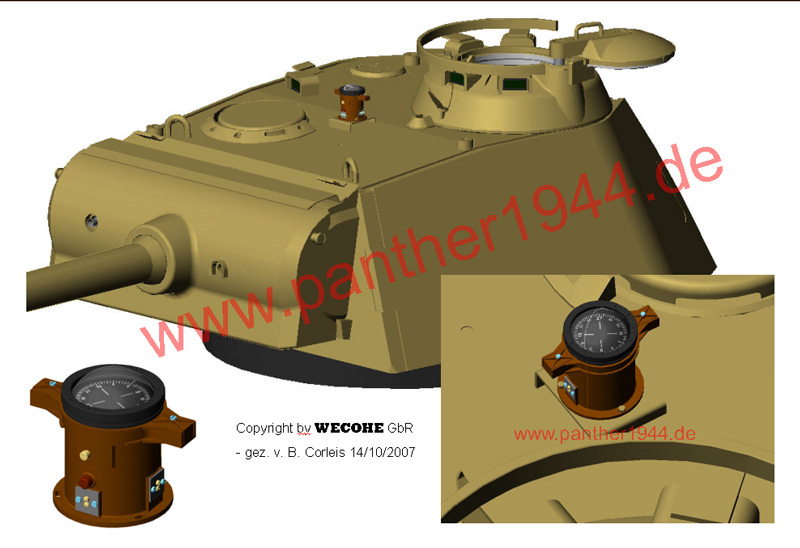 IR-Panthers and UHU should be coordinated by radio and the adjustment searchlight-tank gun should be synchronised using compasses. Was this the determination of the Panther´s Orterkompass? A manual titled "D 2013/2 - Orterkompaß 38 mit Orterkompaßstand für Panzer" had been existing within the army, dated from the year 1945. Was this the Orterkompass that should have been used on the Panther? The photos on our website show this OK 38 in a hitherto unknown mounting bracket with a very strong special compensation, which actually is somewhat exaggerated for airplanes. Therefore, it is conceivable that this particular configuration came to be fitted in armored vehicles. 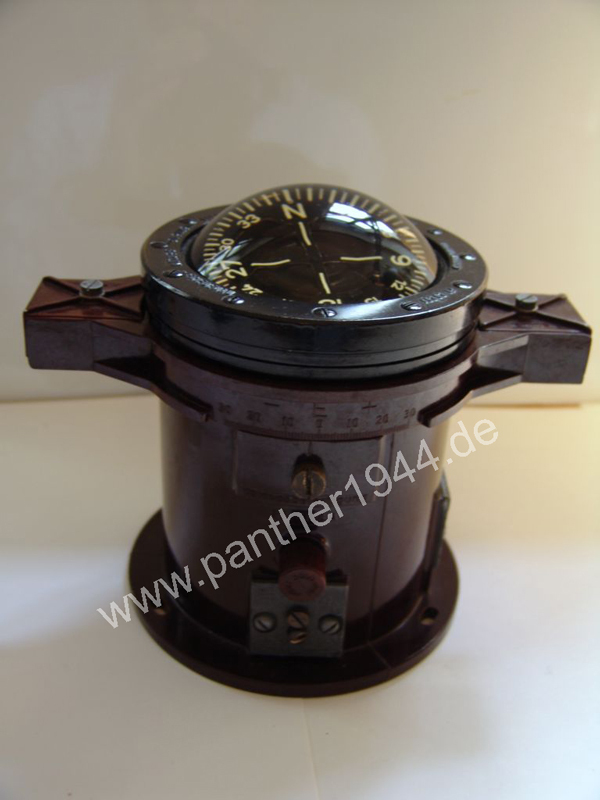 The ultra-fine magnetic compass control is installed in a “Kompasskessel”, which is completely filled with „Kompassflüssigkeit" to avoid strong vibrations of the compass rose and measuring inaccuracy. The special compensation (scissor compensation) is mounted in the bottom of the housing and can be adjusted from outside in North-south direction and East-west direction. Therefore a special screwdriver, called “Schraubenzieher” is screwed to the housing. It also would be possible that the usual OK 38 has been installed in tanks with a special cardan shaft bracket. " 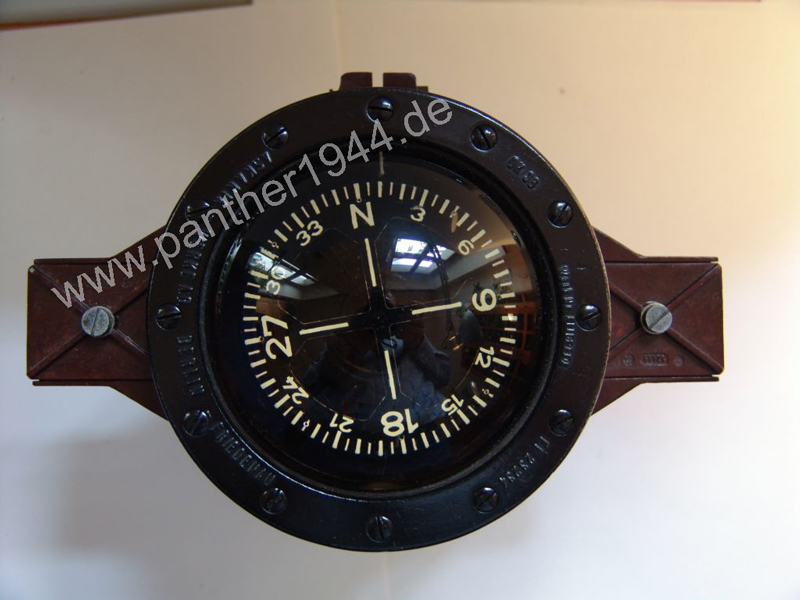 What is lacking is the ultimate proof that the Ok 38 was just that one compass for the Panthers. Meanwhile, a second variant of the Ok 38 has turned up. "However, this variant differs from the first on your web site in that way that the upper part has mounted a Führerkompass FK 38 instead of an Orterkompasses! So a very big effort in this manner! Apparently there was a search for a proper compass for the tank commander, so he could read the dial of the compass well, also when vibrations or a bad exposure to light occurred!" And here pending an image that is supposed to illustrate graphically the existing state of knowledge.